The fearless resolve of Autobot Scoop makes him one of the most relentless warriors on the battlefield. There's no such thing as danger when you can blast enemies with the combined firepower of Targetmaster allies like Caliburst and Holepunch. I don't read the comics. I have absolutely no connection to Scoop as a character. Never owned his G1 toy, or even knew about it. I saw photos of him from various pre-release conventions like Comic Con and Toy Fair - and I really wasn't sold on him. But on a shopping trip with my kids, I picked him up and debated. My daughter told me to buy 'the orange guy'. So I figured I'd go for it - I hadn't bought a Transformer for quite a few months, and at the very least it would be something new. Was it the best random purchase I have ever made? No. But I'm not disappointed at all that I picked Scoop up. 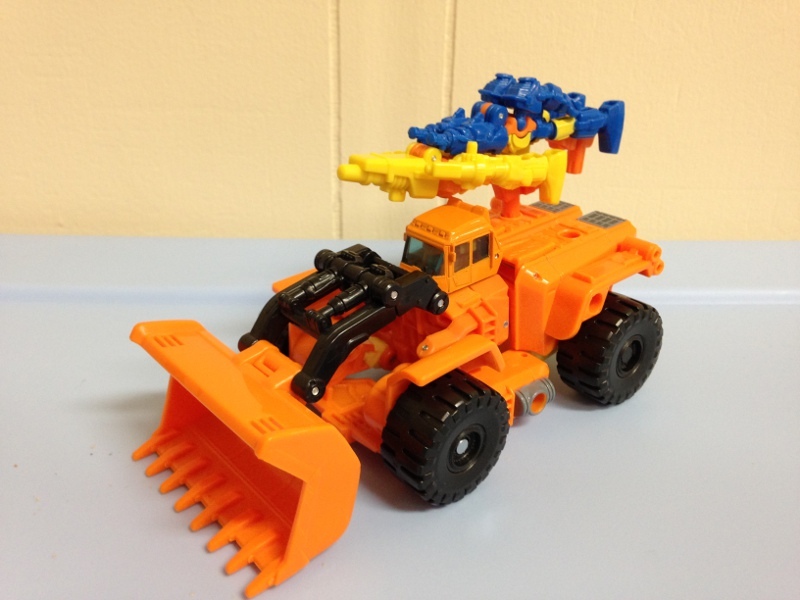 Scoop's alternate mode is a Front End Loader, done mostly in orange. There's only a few bits that break up the color motif: grey tanks on the sides, grey grates on the very back, and the scoop arms, hydraulics, and wheels are black. I suppose you can count the windshield too. Sadly, there isn't much variety to the color scheme. From the standpoint of a construction vehicle with typically bland color palettes, this makes sense. 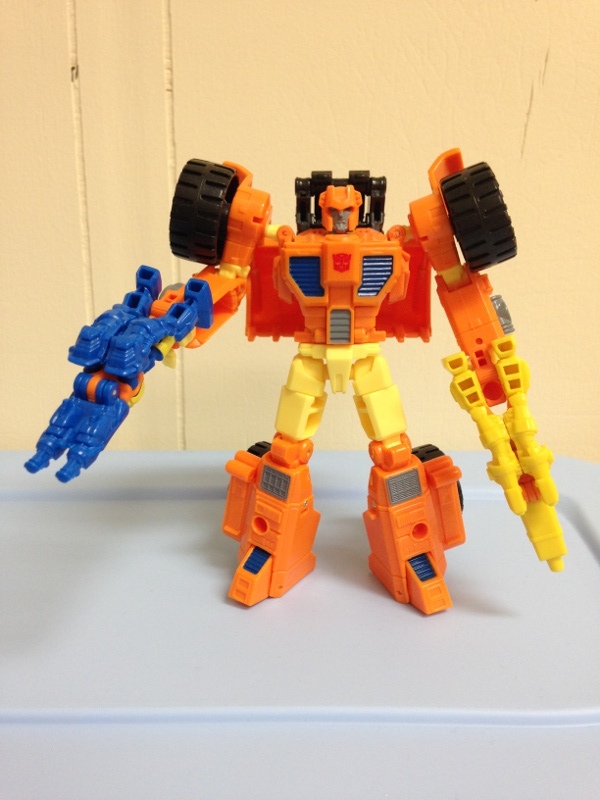 As a toy that's an homage, it's confusing considering the original scoop featured an orange body and a yellow scoop - various convention photos even showed Scoop had this same color pattern. However, the final product ended up fully orange. A simple color change of the front would have gone a long way which I don't think would have been much of a cost driver. It's a curious change that I don't understand. A couple other niggles that I have with the alternate mode would be the gaping hole underneath the scoop. 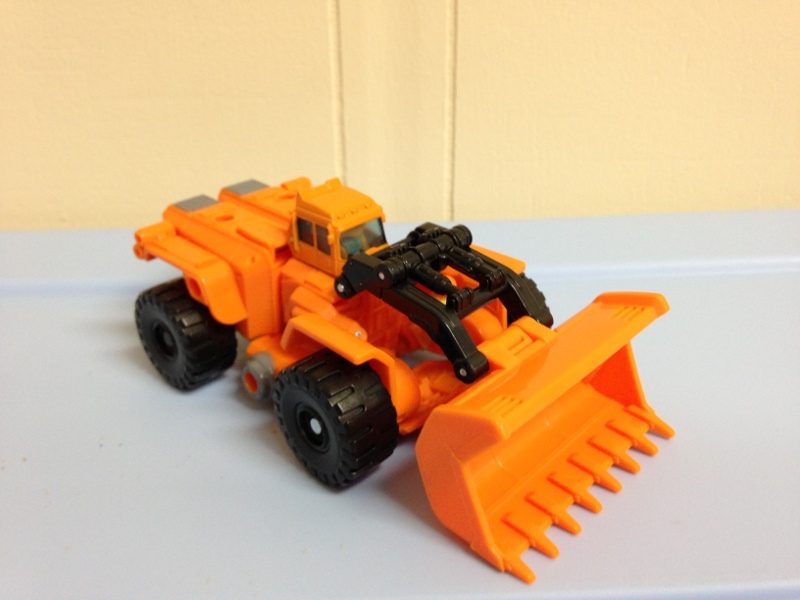 Granted, there isn't much on the front of a real Front End Loader, but the way this one is done is quite hollow. I think it has to do with the chest plate resting on the bottom, basically making a large spot for dirt to gather if this were a real vehicle. Another small issue is the windshield. Hasbro did it right by making the windshield clear blue - the downside is that unless you turn Scoop's head around, he is literally looking out of his own windshield. Look close in the photos and you'll see what I mean. While none of these issues completely wreck the toy, a little bit of extra thought would have helped immensely. On the positive side, the vehicle mode is pretty sturdy. Some of the tabs like to pop in and out but it's not a big deal. The wheels roll well and are large enough to even be useful on carpeting. The scoop is practically fully functional; the arms move up and down while the scoop itself also swivels well. Scoop also has six 5 mm pegs on the outside of the vehicle, which is perfect for plugging in his two Targetmasters. Unfortunately they were molded in a way to make them difficult to peg in without popping out the handle, or to be situated in a straightforward manner. Another small problem, but nothing major. For all around play, I think the vehicle mode ticks all the right boxes. In my opinion, Scoop has a great robot mode. Designed after his IDW incarnation, Scoop looks fantastic. The bright color scheme makes him stand out on a shelf, and the aesthetics hit all of the targets for a good G1 homage. Light yellow upper legs & hands, grey abdomen, and blue chest parts & feet break up the orange well. The detail in the mold is done very well, with small touches like panel lines and grating in various spots. The head mold is fantastic and the light piping works incredibly well - Scoop's eyes are a light blue when illuminated. Hasbro went the extra mile to put 5 mm peg holes on his forearms to allow for the Targetmasters to peg in just like his old G1 self, even though he can easily hold each one in his hands. Honestly if you look at the functionality of the G1 toy, this version of Scoop does exactly the same things - just with much more articulation. Even though Scoop has a feature that many Transformers have - a backpack of extra parts - he is well balanced enough to overcome the weight. Most of this is due to the wealth of joints: there are five joints just between the waist to the knee. The arms are well jointed too, and have a great range of motion. I don't really have any issues with the robot mode. Scoop is solid, balanced, and a lot of fun with both Targetmasters. In case you were wondering, Caliburst (Tracer) is the yellow one, and Holepunch is the blue one. Both Targetmasters don't do a variety of things, which is OK by me. Simplicity keeps them from being painfully difficult to deal with, and for what they are, they work just fine. 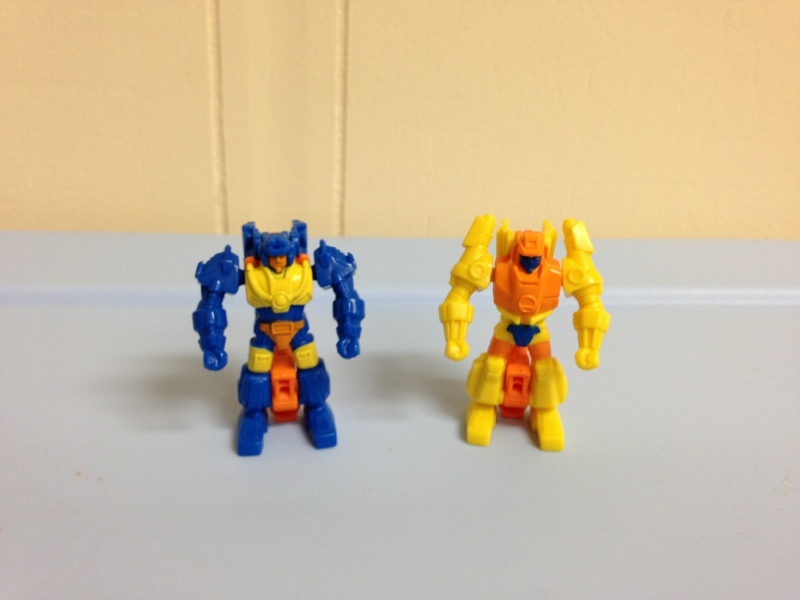 On both, the arms are on ball joints which allows for some decent movement of the arms for such small figures. They can also combine to form one giant rifle or they can be dual-wielded like pistols. 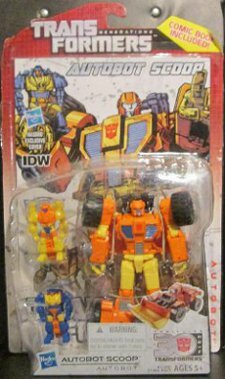 They are a great representation of their G1 figures, the colors and detailing are done very well for small figures, and having both in the package adds to the fun of this pack. Transformation Design: 6. A simpler transformation makes for easy switching. The pegs that hold the front together are fiddly though. I wouldn't say it's incredibly fun. Durability: 9. Scoop is well built, even if the plastic feels quite light. My 2 year old abused him for about 30 minutes with no problems. Fun: 8. Scoop is well balanced and articulate. Two Targetmasters add to the fun and combine. The front scoop is quite movable, and the large wheels roll nicely. Aesthetics: 8. He's bright orange/creamscicle color - certainly eye-catching. The robot mode looks nice and clean. The vehicle mode looks good but the front end is empty. Articulation: 9. There's a good amount of joints that aren't hindered by anything. He can get into good positions, but the somewhat small feet could case problems. Value/Price: 7. $15 is kind of hefty for an obscure character. He's fun and looks good though, so it balances a bit. Overall: 6. Scoop is a little above average. As a toy he hits a lot of good points for fun, articulation, and looks. He's an obscure character though, so unless you're a fan there isn't a big driving force for you to pick him up.